When it comes to pasta, nothing beats homemade. While store-bought pasta is great for convenience, the taste and delicate texture of fresh pasta brings a whole level of flavour to your pasta dishes. Italian chef and CAE tutor Simone Mancin shares how to make the perfect pasta and a basic homemade pasta recipe that is sure to impress at your next dinner party. When shopping for your ingredients, make sure you don’t compromise on quality. 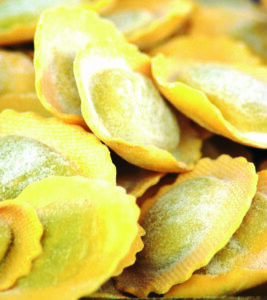 Use a good quality Italian type 00 flour to create your pasta dough. The 00 in the name refers to the Italian grading system to indicate how finely ground the flour is and how much of the wheat bran is removed. While a single 0 flour is coarser in texture and a 000 has a powder-like consistency, type 00 is a balanced, everyday white flour that will result in a softer, silkier and more delicate pasta compared to the standard all-purpose flour in your pantry. If you are new to creating your own pasta, it’ll be a lot easier and less intimidating to invest in a pasta maker. Using a machine will also achieve consistent pasta sizes and thickness, giving you a near-professional result every time. Once you’ve invested in a pasta maker, it’ll be hard to go back to dry, store-bought pasta! If you are new to rolling pasta, it can be hard to turn the crank and guide the dough at the same time. A great tip is to enlist a helper. This way one person can turn the crank and the other can guide the dough into the machine with one hand, and delicately handle the dough when it comes out to the other end to reduce the chances of accidental stretches or tears to your freshly rolled pasta. If you want your pasta to be al dente, make sure your water is boiling before you place your pasta into the pot. Once your water reaches boiling point, add some salt into the water. The reasons for this are two-fold. First, adding salt to your water will allow to reach a higher boiling point. This is important because the perfect pasta should have as little contact as possible with water to give your pasta a better texture, and if you follow this method the pasta shouldn’t take more than 2-3 minutes to become al dente. Second, adding salt will season your pasta. Another tip is to avoid adding oil to your boiling water. Adding oil to your water is unnecessary and affects your pasta dish. Pasta that has been covered in oil does not absorb sauce as well. A better way to preventing pasta from sticking together is to add more water when you boil your pasta. Try using 1 litre of boiling water to every 100 grams of pasta to dilute the starches, which is what causes pasta to stick to each other. When your pasta is cooked, drain your pasta over the sink using a colander. Do not rinse your pasta. Good pasta shouldn’t need to be refreshed under cold running water and will only be an issue if you haven’t added enough water during the boiling phase (see above). When you rinse your pasta after it’s cooked you cool down the pasta, which stops the cooking process and prevents the pasta from absorbing the sauce you have prepared. The only time to rinse your pasta is when the pasta is sticking to each other, if you have overcooked the pasta or when you are making a cold pasta dish. Place flour into a metal bowl. Crack open the eggs and add 2 Tbsp oil and a few pinches of salt to the flour. Knead ingredients together until the dough is firm. Place the dough onto a work surface and continue to knead for approximately 10 minutes. If the dough is too soft and sticky, add a little flour. If too dry, add a little water. Cover the dough with a damp cloth and rest for an hour. After an hour, dust your work surface with a little flour and roll the dough until very thin (approx. 1mm). Alternatively, you can roll the dough through a pasta machine. Cut pasta into desired strips or shapes. Note: If using the dough for ravioli or tortellini, I add quite a bit of water to create a softer dough. Softer dough is more elastic, holds (and sticks) better together and does not open up as easily during cooking. Simone Mancin is a European trained chef who loves teaching people how to cook. Simone started his career working in leading restaurants in Italy, London, France and Switzerland before travelling to Australia in 2010, where he worked in Melbourne restaurants including Grossi Florentino, 400 Gradi and Locale at De Bortoli Winery, before road tripping around Australia and heading back to his home in Italy. Since Simone’s permanent return to Melbourne he has been teaching a range of exciting cooking classes at CAE in between working at Etihad Stadium’s prestigious Medallion Club restaurant. 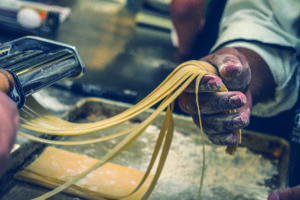 If you’re interested in getting started in the kitchen, have a look at Simone’s upcoming Pasta Fresca: Fresh, Handmade & Authentically Italian, Kitchen Boot Camp: Hands-on Cooking Skills for Beginners, Kitchen Knife Skills, Introduction to Basic Bread Making and Classic French Cooking short courses.